Blues and Tipp Bring the Silverware Back East. 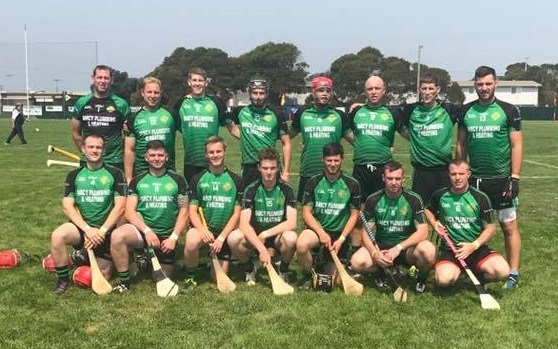 San Francisco hosted the 2017 North American GAA finals on Labor Day weekend. The games were played at Pairc na nGael on Treasure Island, San Francisco GAA’s home facility. Treasure Island is a man-made island in the middle of San Francisco Bay that was created from dredging the harbor to make for safer shipping channels. The island was created in 1937-38 and the Golden Gate Exposition was held there in 1939, from which a lot of art deco style buildings remain. The island was also the home for a naval station, and the San Francisco GAA opened their fields there in 2009. It is accessible by road via the Bay Bridge and is just a short drive from downtown San Francisco. Six teams from the Boston Northeast division made the 3,000 mile journey west to participate in the finals. In senior competiton were the Shannon Blues footballers, Fr. Tom Burke’s hurlers, and Boston Shamrocks Ladies footballers. Cork competed in the junior A football, Tipperary in junior A hurling, and Donegal in junior B football. A Great First North American for the Shannon Blues. Saturday saw two Boston teams progress into the finals. The Shannon Blues had a convincing win against Donegal Philadelphia with goals from James Feeney, Kieran Hurley and Darren Wallace seeing them to a 6-10 to 0-6 win. Tipperary also made the Junior A hurling final with a 4-18 to 1-5 win over Vancouver. The Shannon Blues captured the senior football championship for the first time in the history of the club on Sunday. The Boston side faced host team, Sean Treacy’s in the final. The Blues fielded 5 of the starters from the Boston final two weeks earlier, and included no less than 6 players from the junior team in the starting 13. Playing with the wind in the first half, the visitors built a sizeable six point lead at half time. Kieran Hurley swung over some well taken efforts, with Darren Wallace doing some great running. A goal from Hurley just before half time saw the Blues into a 1-7 to 0-4 lead at the break, but Treacy’s would have that wind advantage in the second half. The home side made the push and the game was tied coming down the stretch. With the Blues struggling to make headway against the breeze, Treacy’s won most every midfield ball and capitalized on the possession. Eventually a penalty brought it to two points, Mike Moriarty got his fingertips to the ball, but the kick had too much behind it and the it found the back of the net. The Blues back line was under extreme pressure and had to dig in. Two more points made it level and Treacy’s had the momentum, but wasted several golden chances to go ahead. There was a late push in the Blues however, and the Boston side wet into a one point lead after substitute Jimmy Maher put them ahead. Fresh legs from Pat Moriarty also helped the Blues cause. After the sides were level again, Moriarty won a scrappy kickout and set Darren Wallace free for a point to put the Blues one to the good again. After Treacy’s missed another chance, a quick kickout to Barry Hartnett set up a goal in a move involving Wallace and Moriarty, and finished with emphasis by none other than maestro, Hurley. Treacy’s had one last chance to score and the shot flashed across the face of goal. And so it was the Blues 2017 North American Senior Football champions by a score of 2-11 to 1-10. It was a great victory to top off a season that saw them grow into the Boston championship and come good at the right time. The Blues team that captured the first ever North American Senior Football Championship for the club was: Michael Moriarty, Derek O'Brien, Fionn Herlihy, Trevor Wallace, Barry Harnett, Conor Kerins, Pat Murray (AB), Maurice Young (AB), Steven Conway, Darren Wallace, Conor Fitzgerald (AB), Steven Conroy, Kieran Hurley. Jimmy Maher, Pat Moriarty, James Feeney, Mike St. Bernard (AB), Shane Kelly, Conor Mullen. Tipperary ended up capturing the Junior championship with room to spare after great overall team performance. Facing an Auston Texas side, the Boston lads had put plenty of daylight between themselves and the Cowboys by half time. With captain Jimmy Maher on form, and Seanie McGarr and Cathal Madden tight at corner back, it was a 4-10 to 1-8 half time lead for the Premier county. Sean Delaney pulled off two wonderful saves and at the other end of the field the bulk of the scores went to Russell Quirke. The Cappaghwhite man tallied 7 points from frees and ended with a haul of 4-7. Joseph O’Sullivan tallied 3-3 in the other corner, while Cronan Dempsey chipped in with two points from center back. Fr. Tom's came up against a strong Naomh Padraig side from San Fran. Cork junior A footballers were unlucky to get knocked out at the semi-final stage by a last minute goal having led by 0-16 to 0-14. The Boston Shamrocks came up against a very fit Charlotte team, which contained just 2 Irish born players, and an Olympian playing in goals. The Shamrocks came back with the help of goals from Sara Jane McDonald and Eadoin Connolly after falling behind early, however the Charlotte keeper proved to be a game saver as on two occasions in the final stages. With the Shamrocks putting the pressure on, Sara Jane McDonald and Shannon Mullen were through only to be denied by point blank saves. The final score was Boston Shamrocks 3-6 Charlotte 5-9. Donegal junior B footballers were also denied a place in the final following a 2 point loss to San Diego. Diarmuid Moyne and Matthew Cutliffe were on form up front, and at the back Ciaran McDevitt and Sean Winston defended well. There was a chance to win it at the end, however, Gerard O’Kane’s shot blazed wide with the keeper to beat. Fr. Tom’s also went out at the first hurdle to a strong home team in Naomh Padraig who went on the win the championship. And so, the end of another Boston and North American GAA season with 2 national trophies headed back to the New England. A year from now the finals come back east with Philadelphia hosting.